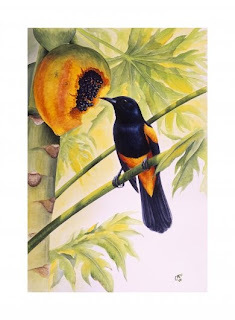 Dr. Christopher Anthony Cox is among the few recognized wildlife artists in the Caribbean. Christopher was born in Toronto, Canada on May 21, 1967, to a St. Lucian father and Jamaican mother. At the age of 5 he and his family returned to St. Lucia where he currently resides with his wife and 3 children. Christopher attended St. Mary’s College from 1978 to 1983 and under the tutelage of Luigi St. Omer (son of renowned St. Lucian artist Dustan St. Omer) was among the founding members of the St. Mary’s College Art Troupe in 1978. In 1985, Christopher joined the Forestry Division where he was assigned tour guide duty on the Central Rainforest Trail, among the first eco-tourism sites on St. Lucia. It was then that he started painting wildlife and environmental themes, assisting in production of environmental education material for the Forestry Division. In 1987, he went on the University of New Brunswick (Canada) to pursue a 5-year BSc degree in Forest Resources Management. On returning to St. Lucia he became Assistant Chief Forestry Officer (Operations) where he specialized in watershed management. He integrated this work in a Masters (1997) followed by a PhD (2003) degree from McGill University in Montréal, Canada. In 2002 he was appointed Chief Agricultural Planning Officer in the Ministry of Agriculture. In 2005, he joined the Caribbean Environmental Health Institute (CEHI) where he currently holds the position of Programme Director. CEHI is the CARICOM agency responsible for environmental matters in the Caribbean region. Over the years, countless hours of fieldwork in some of the most remote forests on the island awakened his appreciation for the stunning diversity of plants and animals. His keen interest in environmental conservation has been the inspiration behind his work. OMG!!!! I Have that very same print and another from him. I saw the name, but I didn't realise it was the same guy from forestry. An artist too? I LOVE his stuff. I am trying to get my mother to get me some more of them actually! Kudos to Christopher.